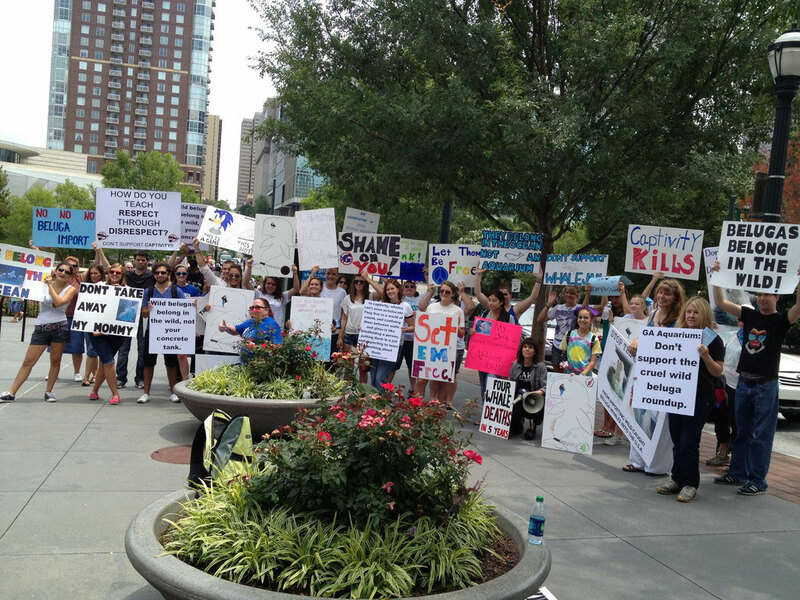 On Saturday, July 21, GARP (Georgia Animal Rights and Protection) participated in a demonstration outside the Georgia Aquarium. 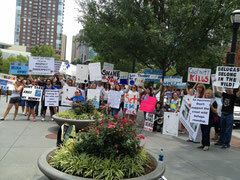 The protest was organized by Free The Atlanta 11 and Cyber Whale Warriors. The aquarium has applied for a permit to import 18 wild caught beluga whales to be sold to aquariums and zoological parks across the US. (Sign the petition to stop this here.) The protesters were a diverse group including people from several countries and even some children, sporting homemade signs and distributing information to passersby. The speech given over the megaphone was given in both English and Spanish. They spent the afternoon urging the people waiting in line to not buy a ticket and informed them about the planned import of these whales. We were so proud to be able to cover this important event. So, why all the uproar? Why the protest? Well, the idea of animals in captivity at all is disturbing enough, but ripping these highly intelligent and social animals from their home in the ocean, their pod, and their very families is just heartbreaking. Since calves are dependent upon their mothers for about two years, let’s hope that none of these whales left a baby behind. According to the Georgia Aquarium’s blog, the whales “have been collected by Russian scientists in the Sea of Okhotsk in northern Russia”. Collected. Interesting word choice. A quick search on the web yielded this photo of the facility where the “collected” whales are being held until they are transported to the US for sale. From the ocean to a holding pen to a concrete tank for human entertainment. But aren’t aquariums there to help the animals? Aren’t they all about conservation? 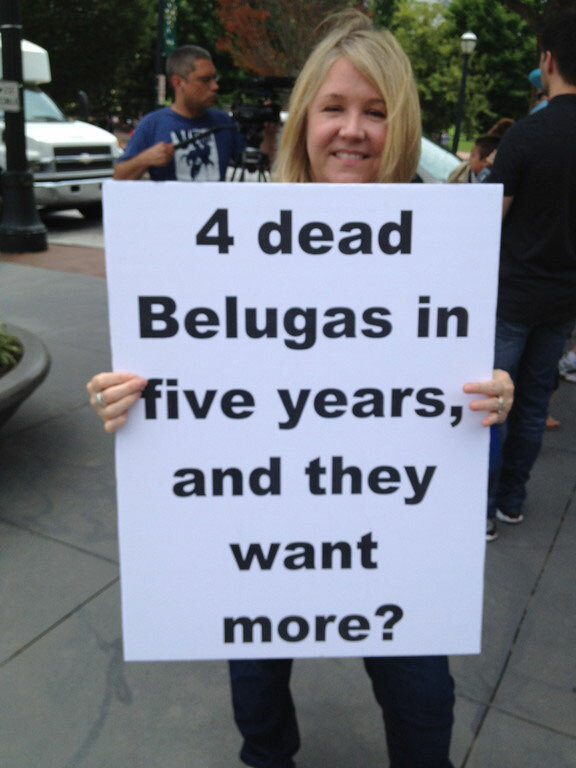 Well, four belugas have perished at the Georgia Aquarium in the last five years. Belugas can live 35-50 years in the wild. I was unable to find information on the ages of all of them, but only one is said to have died of natural causes. Her name was Marina and she was 30 years old. The most recent death was a five-day old calf, who was born in critical condition. Given that the mortality rate for captive beluga calves is 65%, it’s fair to say they knew this baby would have little chance of survival when they bred Maris, the calf’s mother. 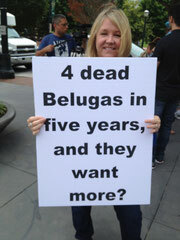 There are currently 34 belugas in captivity in the US, living in aquariums and zoological parks. Adding these 18 whales will increase that number by almost 50%. 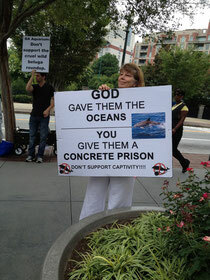 That’s 50% more whales who may die premature deaths in captivity. Shortened lifespans for captive marine animals are well documented. Dolphins for example, live 40-50 years in the wild, but captive-bred dolphins at two different Sea world facilities typically live just 4-5 years. Orcas don’t fare much better, with a natural lifespan of 60-90 years and very few living past the age of 20 in captivity. For more on the ethics of captivity, please read this article from PBS and watch this video (the video provides a counter argument as well). The PBS article is long, but is well worth it. More information related to cetaceans in captivity can be found in this handy PDF. The Animal Welfare Institute also has excellent information about whales and dolphins. For comprehensive coverage of these specific whales, please visit coveblueforjiyu.